This is how i would like to build my presentations - full of content with many possibilities of comparing features from different points of view. A load but not overload of theory. Currently : 2 passed quizzesI didn't know a lot about this subject, until I took this course. This taught me a lot and made me want to know more. I would like some examples of some northern hemisphere related radar signatures. Instead of using all Australian radars, throw in some American radars. Some of it was hard to completely understand. The questions were very tricky. Good information but there is no video or audio recordings to present the information. It is all strictly reading it yourself and I know I myself learn better with both audio and visual. But like I said before, lots of good information. 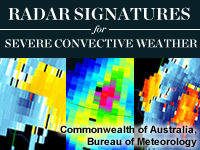 Clearly structured, well explained and with many examples of the different radar signatures. As a non-native English speaker and beginner to the radar topic it was still good to understand. However, some knowledge about the structure of thunderstorms and supercells is recommended. Identify signatures associated with potentially severe convection. Describe appropriate techniques for identifying particular radar signatures within a volume scan. Use knowledge of conceptual models of convective storm structures to determine the mode of convection indicated by particular radar signatures. Given a convective storm type, determine the location and timing of potential storm-induced damage. Estimate the likelihood that a particular radar signature indicates the presence of severe convection. 2012-12-22: Supercell Conceptual Model, Definition, Fig. 6 was updated to properly show relative strength of shear vectors at level 4, correct improper labeling in the legend, and to correct an error in the caption regarding the location of the low at level 4. 2017-06-01: converted animation to mp4.